Kemper’s new StalkBuster is designed to break up the crop stubble directly below the self-propelled forage harvester’s header, destroying the overwintering habitat of the corn borer pest and reducing the risk of fusarium in the soil. An additional mulching operation is therefore no longer necessary. The StalkBuster is integrated into the base frame of Kemper’s rotary crop header. A special flail crushes every row of stubble before the wheels of the forager and transport vehicles can flatten it. As a result, the stalks are not only cut down but also smashed into small pieces. A special swinging gearbox allows optimum ground adjustment for each individual row, while a pneumatic pressure system provides additional close tracking of ground contours. 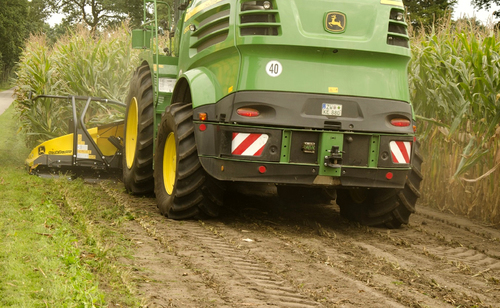 This ensures that every stalk is fully chopped down to ground level. The flail has been manufactured from highly wear-resistant material to guarantee a long service life. The StalkBuster’s low cutting action and thorough destruction of the stalks eliminates the corn borer larvae’s habitat in the stems and thus reduces the risk of fusarium developing. Furthermore there are no obstacles presented by bulky harvest residues to subsequent tillage operations. Power consumption of the StalkBuster is surprisingly low. With its direct drive and optimum ground adjustment of the individual units, no more than 4hp is needed per row. In areas particularly affected by the corn borer, the StalkBuster reduces the need for chemical applications, which also eases the following tillage operation. The total economic advantage of using the system is estimated at around €84/ha, compared to the best existing solution (ie mulching).